5 Manhattan locations with the hottest hot chocolate. 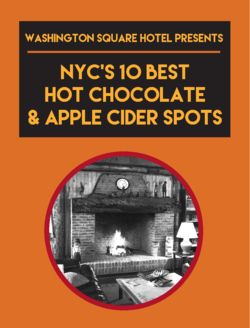 5 Manhattan locations with the freshest apple cider. Photos of drinks from each location listed. Since the beginning of time (well, by our accounts anyways), hot cocoa and apple cider have been most people's go-to's when it comes to warming up cup-side during these chillier months... and, well, New Yorkers are no different. The exception for New Yorkers? Manhattan has lots of options for finding the perfect cup. In this free ebook we’ve taken the time to research through and sample some of those options to narrow them down. These 10 picks are some of the best, choosing your favorite is up to you! *Fill out the form to the right to download the ebook.